Review previous class. How many different kinds of tree can you recognize on campus? How many can you name? How many can you group into a genus? into a family? Have you thanked a tree lately? Have you shared any secrets with your partner tree? Check parent permission to leave campus during science for science activities. Observe the sprouting seeds on the balcony. What differences do you see between the dicots and the monocots? How might this difference be explained by botanists interested in plant evolution? Examine data on campus trees from previous years. 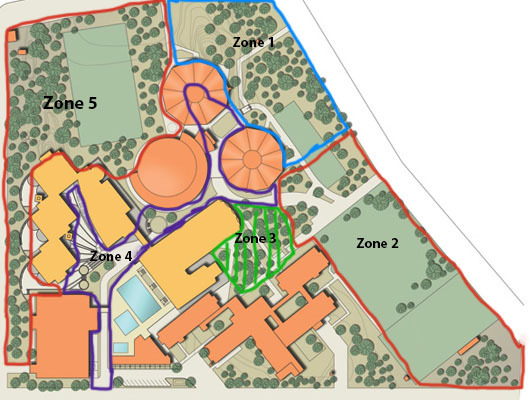 Examine campus map (Zones only correct for 2017-2018). See summative project on Tree Diversity from last year. Review carefully. We will discuss what the summative will be like for you this year. Sci 7 17-18 Biodiversity Survey—Assessment Project (due beginning of class 5 March in print copy AND correctly labeled and uploaded in your DSN). Due: March 5 & 6 at the start of class. What the tree is used for. Is it eaten by people? Animals? Used as a medicine or for houses? Do animals nest in it? Is it poisonous? Is it native or introduced? Submit your book page as a Google doc in your DSN and in paper copy. Font = Calibri 11. Include name, period, date, tree names on a separate title page. This part will be a 2 page document. You may check surveys from previous years for comparison to yours. Preventing Plant Blindness (from Wandersee and Schussler). Describe how closely your experience corresponds to the following. To what extent are you becoming less “plant blind?” Explain.